The Comfort Hotel Trondheim is located in the centre of Trondheim, right by the Nidelva river and the Bakke Bru bridge. The hotel has a gym, meeting rooms and a lobby shop. Guests can also look forward to a great breakfast! 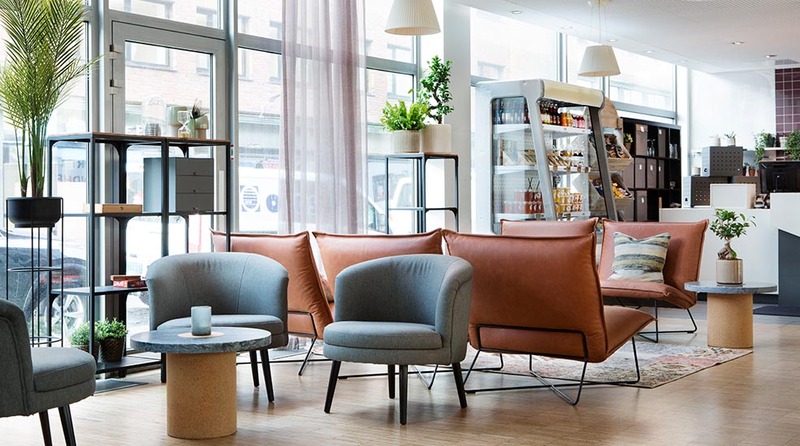 Everything is within easy reach when you stay at the Comfort Hotel Trondheim, with just six minutes to the central station and the airport bus terminal just around the corner. Trondheim's famous square is 8 minutes away. And before you head out to explore Trondheim, you can buy a nice coffee or a delicious snack from our coffee shop. Read more about Trondheim here. On a sunny day, you can enjoy eating breakfast as the sunshine streams into the breakfast room. Our breakfast buffet features a range of delicious Scandinavian specialities with plenty of organic produce. In case you're heading off to an early meeting or you have a morning flight to catch, you can get an "early-bird breakfast", which is available from 5am and includes bread, cold cuts, cheese, juice, yoghurt and coffee. Please let us know the day before if you would like us to arrange this for you. We are so proud of our décor and furnishings! Anders Björkén has designed the 194 stylish rooms, as well as the lounge areas and other public spaces. Come and see for yourself - you won't be disappointed! The Comfort Hotel Trondheim has modern conference facilities in exciting, urban surroundings. With comfortable chairs and free WiFi, this is the ideal place for your next board meeting! We also have an agreement with the nearby Nova conference centre for up to 400 guests. There are a range of options when it comes to refreshments, and we will gladly assist you in arranging dinner, drinks and social events. You can always end the day with a drink in our Barception too! The gym features a range of equipment including exercise bikes, rowing machines and weights. There's something for everyone! And best of all, you can enjoy a good workout whenever you like as it's open 24/7! When you stay at a Comfort Hotel, you can enjoy the freedom of free WiFi. So, you can stay connected at all times, all over the hotel! If you have a late flight home, you might like to arrange a late checkout! Maybe you'll have time to finish your book? Or just take some time to sit back and relax! You can stay at the hotel until 6pm on Sundays, and we have late breakfast on both Saturdays and Sundays! Comfort Hotel Trondheim is cash-free, which ensures added security for our guests and visitors. More information about this can be found under FAQs. Follow Søndre Gate and take a left in the junction by the Rema 1000 shop. The hotel is then on the right just ahead. Airport bus to Søndre Gate. We recommend Norges Taxi, phone +47 080 00 and TrønderTaxi, phone +47 073 73.